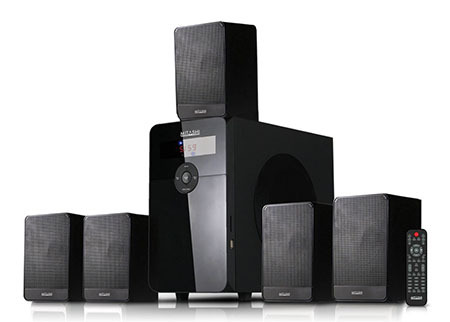 Which is the Best 5.1 Home Theater System Under Rs 10000 in India? We all love music and for quality music, you just need to spend little bit money. But which Home theater system offers the best value for your money. There are plenty of options in the market but choosing right thing is very difficult but hey don’t worry we are here to help you. 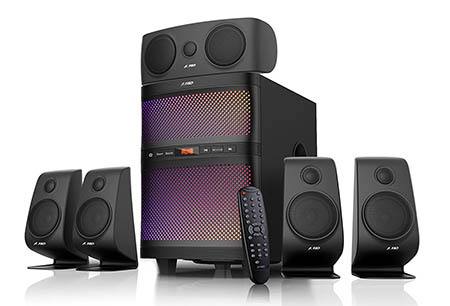 There is mainly 3 type of surround sound home theater systems available in the market 4.1, 5.1 & 7.1 and in this article, we are going to take about 5.1 Home theater system under Rs 10000 which is ideal for home or small hall. First, I want to clarify some things like what you got in 5.1 home theater system in this package you got six-channel surround sound audio systems. There is one main sub-woofer also called central speaker and 5 small speakers which all are connected with central Speaker, two front speakers, two side/back speakers and a sub-woofer unit. Surround sound is definitely the best way for anyone to watch high definition movies or television, regardless of the genre. You will feel like you are right there in the theater. Aside from the obvious benefits, these speakers can be enjoyed for a pretty affordable price. 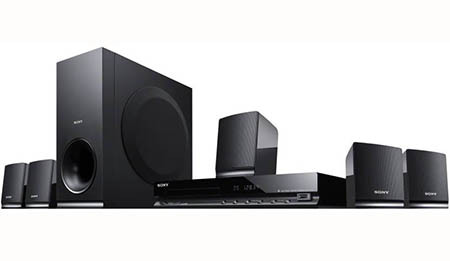 Sony is known for high-quality audio products and oh my god Sony DAV-TZ145 product amazing sound environment around you with surround sound and this sound system support Bravia Sync, Dolby Digital, Dolby Pro Logic, S-Master. This is only for those who are looking for a Quality sound system. If you are expecting Heavey Bass then I don’t recommend this to you. This Speaker system is only for those who loves watching movies and listening to music without deep bass. F&D is now a well-known brand in India for audio products and F&D F5060X is one of the best products from Fendaaudio. This product produces amazing sound environment around you with heavy bass output. There are plenty of connectivity options like Bluetooth 4.2 connection, local music, aux input, FM radio, USB music, LED light. 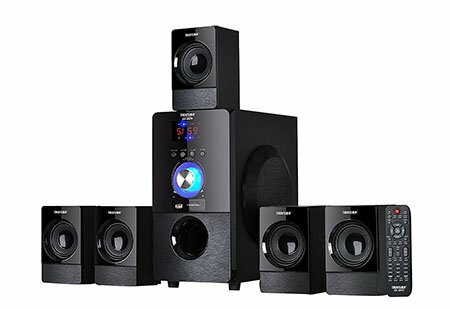 Truvison SE-5075BT is a great option for Best 5.1 Home Theater System Under Rs 10000 because it offers all the features and connectivity options but at a much lower price if your budget is Under Rs. 7500. The Truvison multimedia laptop speaker features five satellite speakers and one subwoofer. It has a combination of black and grey which gives a fantastic look. Versatility, this Truvison laptop speaker supports Bluetooth, USB, AUX, FM, MMC. It is compatible with digital music players, computers and portable listening devices. You can control this audio device from anywhere with the remote control. Mitashi 5.1 Home Theater provide 8500W PMPO Output and compatible with TV, DVD players, Music system, PC, Laptop, Mp3/Mp4 players and Smartphones. This Home theater offer heavy bass from sub-woofer and the smooth full range satellite delivers provide extremely balance sound. Dolby Pro Logic II does it by transforming high-quality stereo sound into 5.1-channel surround sound so rich and realistic that it completely changes your audio experience. As of course this comes with fully functional infrared remote control. The Sultan-BT-RUCF speaker has a glossy finish, plush looks, and powerful sound. This Sound Monster 5.1 home theater system offers a high-resolution audio and the subwoofer provides the subtlest of sounds. This surround sound system comes with Bluetooth functionality, Built-in FM, and full function remote control. The total output power (RMS) value of this device is 140W. 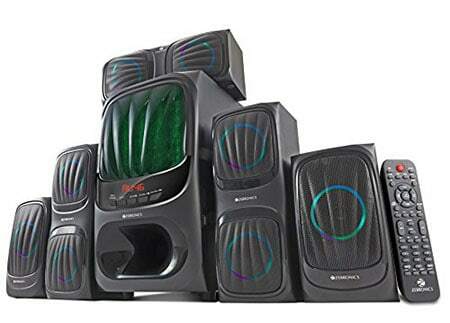 So Guys that is Our List of Best Home Theater system under Rs 10000 If you guys still confused Here is my personal opinion if your Budget is complete up to 10000 for F&D F5060X offers the best value for your money if your budget is around 7000 you can choose anyone from last 3 Options. But if you want quality sound experience and you can leave Bass the Sony Sound System offers good value too.